The Countdown to All Out War continues with Article Five. 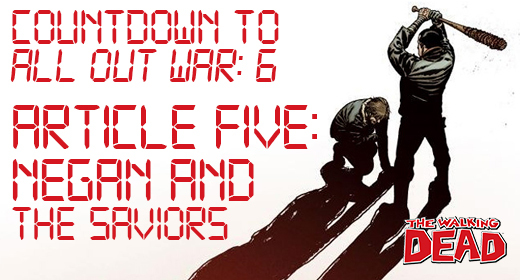 Welcome to day five of the JustUs Geeks War Report countdown to All Out War. We only have five more days until we get to experience the excitement of the war between Rick’s Army and Negan’s Saviors. The Walking Dead has featured some interesting villains, but Negan and group of misfits are by far the largest and most organized. Today we are going to discuss who Negan and The Saviors are. From their introduction in issue 97 until the events that triggered the war in issue 114, The Saviors have been a force to be reckoned with, partly in thanks due to their charismatic and psychopathic leader, Negan. As soon as they appear violence erupts, and they have been clashing with Rick ever since, leaving a long list of causalities already. Negan himself is ruthless, intelligent and unapologetic. He knows what he is, but he does not care. He only cares that he and his Saviors are paid their tribute, and that the communities obey his rules. We really do not know a whole lot about the Saviors, as the group has primarily just appeared as muscle for Negan. Our biggest source of information for the workings of the Saviors issue 105, when Carl was allowed into their base after attacking it. Their base itself is a very heavily fortified factory , and is referred to as “The Sanctuary.” But, this is not their only base. Rick’s group has learned that they have many smaller bases around the DC area. Within the base lives at least 100 members of the group. They are ruled, fairly harshly, by Negan who has instituted a form of ritual punishment for those that disobey his rules. Beyond that, the Saviors almost revere Negan in a cult like way, even though he is cruel and rules with fear. The primary concern for Rick’s group, when it comes to the Saviors, is their vast size, and how well they are armed. Never has Rick had to face an enemy so large and well organized. Even with the men and supplies that he has procured through his alliance with Jesus and Ezekial, it is likely that Rick will be out maned and outgunned by Negan. Thankfully, for Rick he has an ace in the hole. Due to Negan’s ruthless rule of the Saviors, Dwight, a member of Negan’s inner circle, is claiming that he wants to turn on Negan, and assist Rick. Whether he is lying or not has yet to be revealed, but either way, Dwight could be one of the deciding factors in the war. After the prison arc, The Walking Dead fans everywhere lamented the fact that Kirkman may have used one of the best comic villains ever way too early in the series. Topping the Governor was going to be nearly impossible. Negan gladly stood up to the plate, and with a few swings of his bat at Glenn’s head he knocked his role as villain out of the park, surpassing anything the Governor did. Yet, I still want to like him, regardless of what he has put Rick and company through. Unlike the Governor, he actually possess charm. He can genuinely be nice guy. That’s actually the scariest part about him. One minute he can be offering to play pool with you, the next he has gutted you. This unpredictability could be one of his greatest weapons against Rick. Every encounter that Negan and Rick have had has ended up in Negan’s favor, except for the events in issue 114 that triggered the war, and if that is any indication on how the rest of the war goes, Rick and company are going to have a hard time winning. Negan’s well rounded nature makes him by far the most dangerous foe that Rick has ever faced, and I am not sure that Rick quite respects how dangerous Negan is yet. The battle against Negan and the Saviors is going to be an uphill one for our band of survivors.